Yea working great now, thanks! Two weeks in, using Bigpipe ADSL2+ as our main ISP. Moved from Vodafone naked cable broadband. So far, so good, even at peak times in the evening I'm getting ~5Mb/s download to odd parts of the US and UK using speedtest.net. That's really positive. Major local content is of course close; SkyGo, TVNZ, TV3, iTunes, most ~22ms and a few hops away sitting on Telecom Spark's Akamai cache. 2talk works perfectly as well. Looking forward to IPv6 support too, not too far into this year I hope? When testing out speedtest.net a while ago, the IP address lookup resolved to owner NZGate, who were they? There is scant information about them on the net. Great job though Bigpipe, so nice to have actual unlimited internet with no shaping. 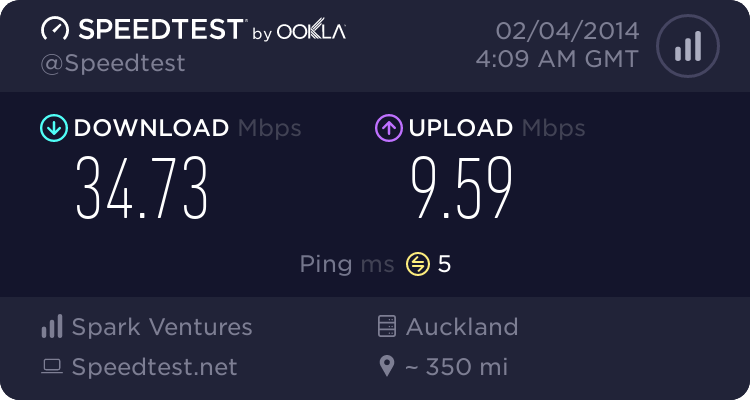 kodiaknz: Two weeks in, using Bigpipe ADSL2+ as our main ISP. Moved from Vodafone naked cable broadband. So far, so good, even at peak times in the evening I'm getting ~5Mb/s download to odd parts of the US and UK using speedtest.net. That's really positive. Glad to hear it's all going well for you. the IP range we were using came from Telecom originally, so for most people was showing up as Telecom, but for a few people showed up as NZGate (I think to do with GGI, but not sure really). Anyway, we are getting it changed, but I think it takes a while for the info to flow through to Ookla etc, so it is still showing as Telecom. Everything has been good so far 14-20ms ping but in the last 3 days since i requested the public ip, there has been a noticeable lag i would say not that substantial at all but i tested the ping and showed 2-5ms jitter, hope this gets fixed, but the experience has still been positive. My flat used 3.9tb of data in February and for some reason Bigpipe didn't get all angry with me. When they say "Unlimited" I guess they mean it. So far however everyone here is loving the connection, the speed and not having to worry about any data cap. Been on BigPipe for well over a month now, and am mightily impressed :) Rock solid VDSL connection, and extremely responsive customer service. I know it's still early days, but this is the most impressive service I've used to date. 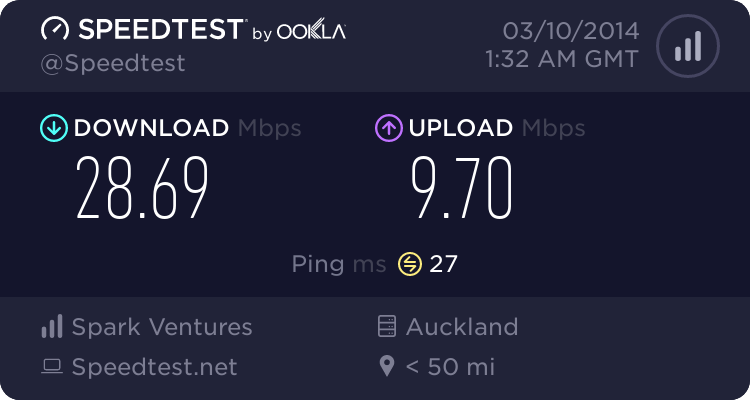 tnaseem: Been on BigPipe for well over a month now, and am mightily impressed :) Rock solid VDSL connection, and extremely responsive customer service. I know it's still early days, but this is the most impressive service I've used to date. good to hear it's all going well. Changing to public IP shouldn't change your speeds. Just a tip: It's best to use your sync rate rather than speedtest.net for comparisons. speedtest.net has too many other factors to be able to do any true apples with apples comparisons. Ah yes, of course. I was being a bit thick there. That first speed test was a mere days into the service, so still in the bedding down period. Looking back, I think the public IP switch happened at the time when things were beginning to settle, now that you mention it! Do you have a policy on the DIA filter now? DarkShadow: Do you have a policy on the DIA filter now? Pretty sure we haven't implemented the DIA filter. Finally got connected on thursday morning, can say I'm thoroughly impressed. tested it out with about 30gb of PlayStation Plus games, streamed the NHL yesterday on NHL gamecenter it was superb, then last night was watching the football on Premier League Pass and there were no issues streaming the 4500kbps stream. JarrodM: Finally got connected on thursday morning, can say I'm thoroughly impressed. tested it out with about 30gb of PlayStation Plus games, streamed the NHL yesterday on NHL gamecenter it was superb, then last night was watching the football on Premier League Pass and there were no issues streaming the 4500kbps stream. So while not as fast downloading files, webpage load times are better!